Koboti is located at the southeast part of the prefecture of Arta and at a distrance of 12 km. from the city of Arta. It is built into an olive grove and its houses are beautiful, traditional and stone-built. It is the seat of the municipality of Koboti. It is also the hometown of the founder of Filiki Eteria, Nicolaos Skoufas, and the member of it K. Gerostathis. The village of Kommeno: In the wider area there is the historical village that it was destroyed by the German army during the Second World War. 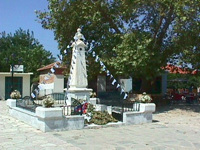 Koronisia is located at the region of Amvrakikos bay and is the seat of the municipality of Amvrakikos. It is at a distance of 26 km. southeast to the city of Arta. It is a coastal village which is located at a picturesque small island. The island meets the mainland through a narrow long passage. In its beautiful taverns you can taste the fresh fish dishes.